The rinse cycle is designed to flush water through fabric removing soil, suds, and detergent residue. The best indication of proper rinsing is the final result after washing and drying. If residue is noticed on clothes, it will appear as streaks and is more noticeable on dark colored loads. Residue is NOT EASILY BRUSHED OFF and is many times mistaken for linting or poor rinsing. Dryer drying usually removes residue from clothes. 1. Using an inexpensive detergent in hard water. These products contain only sodium carbonates and will affect laundering results no matter what brand or model of washer is used. A lint-like, white residue may be deposited on clothes from a reaction with hardness minerals, especially if the water is harder than 14 grains per gallon. Purchase a detergent with a combination of sodium carbonate and aluminosilicates to act as water softeners. The ingredients are listed on the label. 2. Incorrect amount of detergent. See web page on "Lint"
3. Cold water washing. Water may be too cold to activate detergent ingredients. A minimum of 65 degrees F is required for activating both liquid and granular detergent. Granular detergent may not dissolve completely in cold water. A liquid detergent is recommended for better dissolving in cold water. Pre-dissolve granular detergent in hot water before adding it to the wash tub. If cold water setting is below 65 degrees F, allow about 1/4 of the wash tub to fill with hot water and then switch back to cold water. 4. Overloading. Top loading washers - place dry, unfolded clothes loosely in the wash tub up to the top row of holes. Front loading washers - the tub can be loaded completely full of items, but not packed tightly. 5. Use of rinse-added fabric softener. 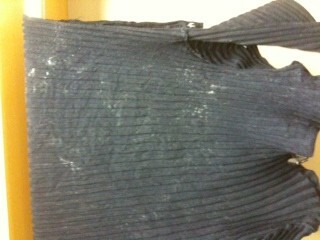 A chemical reaction between rinse-added fabric softeners and detergent may create white deposits on clothes. Dilute rinse added fabric softener with warm water in the fabric softener dispenser. Clean any spilled detergent from the dispenser before adding fabric softener. Change brands of fabric softener. Do not use fabric softener in every load. 6. Washer not draining fast enough. Check the pump out time on a vertical washer. Select maximum water level and allow washer to fill. Manually advance the dial to the final rinse on Regular or press "spin" on touch models. Time how long it takes from the start of spin until you hear all of the water is out of the tub. The water should all drain out within 90 seconds on most models. If there is water remaining in the tub, there may be a drain restriction such as a kinked drain hose, or your pump may be failing.